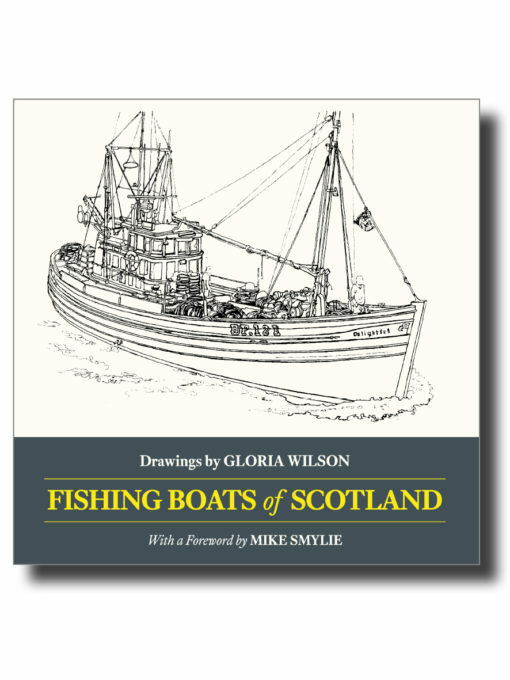 In four dozen meticulous, informative and annotated drawings Gloria Wilson has recorded, both afloat and ashore, the functional beauty of the fishing boat in both timber and steel—mainly of north-east Scotland (with a few craft from Yorkshire, where the artist now lives). A number of vessels were victims of fisheries legislation which mandated not only their decommissioning, but their destruction. “Kipperman” Mike Smylie, co-founder of the 40+ Fishing Boat Association, editor of Fishing Boats, and champion of Britain’s fishing heritage, has contributed a Foreword. Gloria Wilson was born in Surrey but spent her childhood in the Yorkshire fishing village of Staithes. She studied at Durham University under Victor Pasmore and Kenneth Rowntree and gained a BA (Hons) in Fine Art. She has written eight books on fishing craft of the British Isles, and has written extensively for maritime journals including Classic Boat, Fishing News, and Maritime Life and Traditions. Gloria lived in Scotland for some years, but now lives and works in the north-east of England. ISBN 978-1-907206-35-1; 216 x 216mm, 112 pages, 48 drawings. Softcover with sewn binding, cover flaps and matt lamination.